I attach two further photos from my family archives. The first one taken on the steps of the old Baptist Chapel includes my father and some of his friends who formed a group at the Chapel which went under the wonderful title of the 'Young Men's Mutual Improvement Society'. I'd like to have a copy of the subjects of their meetings, obviously no girls were invited. They had all grown up together in the village and were closely associated with the life of the Chapel. I think the photo was taken a little later than the one I sent of the Chapel bi-centenary in 1911 as my father now looks about nineteen. The gentleman in the centre may have been the minister. 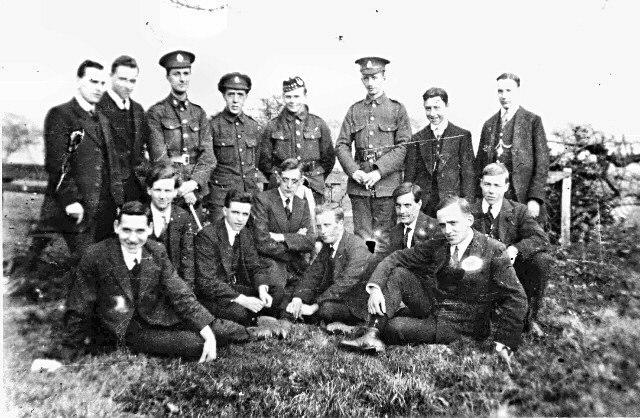 The second photo I believe was taken in 1915 because some of the young men are already in uniform and my father who is also there joined the Navy in 1915. 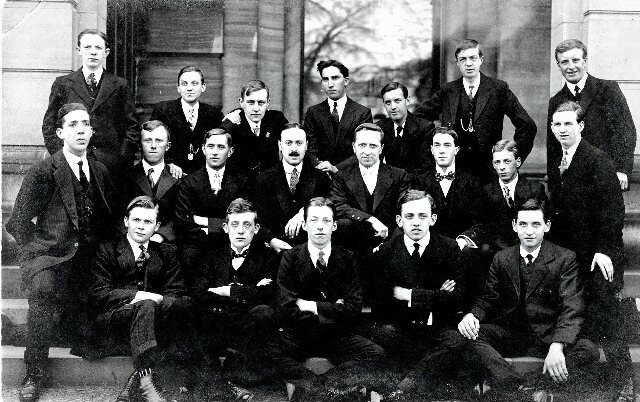 Some the young men appear in both photos, and in the bi-centenary photo with the girls. Can anyone supply the missing names or correct any mistakes? Arthur Bottomley, Willy Preston, Leonard Davy , Cyril Midgley, Charlie Knowles. W(illy) Laycock, Will Midgley, Walter Greenwood, Raymond Whitaker, Arthur Bottomley, Frank Midgley, - - , - - . Charlie Knowles, W Shepherd, Alfred Bancroft, Willy Preston, W Hargreaves, Walter Davy, Cyril Midgley, - - .